The restaurant openings that had been queued up for Moscow pre-crisis are finally thinning out. On recommendation we decided to try one of the last, Alioli. Billed as a Spanish/tapas restaurant, it is on Neglinaya just up the street from the Ararat Park Hyatt hotel, and near the Bolshoi Theater and Lubyanka. Since Passport publisher John Ortega was still raving about the tapas he enjoyed on a recent trip to Barcelona, and Moscow has few if any tapas bars, Alioli was an easy sell. We had warmed up at a tasting of Galician wines put on by the commercial office of the Spanish embassy and arrived early on a Wednesday evening. The entry to Alioli is directly off the street, bright with a view through a wall of tall windows that beckons passersby. This is a new trend in Moscow, though the norm in the West – the habit in Moscow has been to hide both restaurants and customers, and even restaurants that had windows closed them off behind heavy curtains. From the door, Alioli appeared pleasant, if empty, and even the modern style window graphics would lead one to believe that we might be in for a pleasant meal. 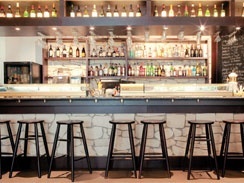 Directly past the door, Alioli’s modestsized dining area has a subdued interior, amply lit with modern furnishings and a bar spread across the very back. The waiting staff was friendly and helpful, and presented us with a four-page English menu: appetizers, salads, hot snacks, soups, paellas, hot fish and seafood dishes and meat dishes. The tapas is laid out at the bar, with a chalkboard specialty menu. So far so good, but Alioli is a Spanish restaurant – where were the scents of hot olive oil, saffron, mint and other wild spices, and grilled meats and fish? And where was the Spanish chef, the master of Catalonian, Andalusian or Valencian cuisine? On inquiry, it appears there is none at Alioli. The assistant manager on duty even had to call the absent manager just to get permission to give us the chef’s name. 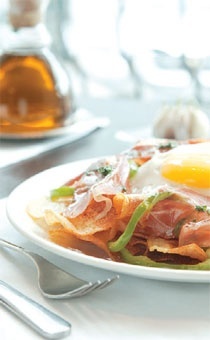 As usual we ordered a range of dishes to share: Alcachofitas Crujentes con Lacas de Iberica (fried eggs with crunchy artichokes and jamon – 340 rubles), Patatas Panadera con Iberico de Guijuelo y Huevo Roto (fried egg, potato chips and jamon served with green sauce – 300 rubles), Arroz de Huerta (paella with seasonal vegetables – 310 rubles), Arroz con Gambas y Trigueros (paella with red prawns and green asparagus – 490 rubles), Surtido de Carnas a la Plancha (assorted grilled meat with lettuce leaves and green oil – 730 rubles), and Solomillo de Ternera con Salsa de Queso (grilled veal fillet with potatoes, asparagus and piquant cheese sauce – 650 rubles). To check the soups, I also ordered Sopa de Expinacas con Queso (spinach soup with cheese – 250 rubles). I went to the bar and picked an assortment of tapas to share at the table (sold by weight – per 100 grams) and a plate of jamón serrano (sold by weight – per 50 grams) was also sent over. For a restaurant review we look for adjectives to describe each of the dishes and wine, and also at Passport we also normally prefer to say nothing if unable to say anything good. I am afraid we now break the second principle – with few exceptions the principle descriptor that could be used for the food was “forgettable”, the exceptions being, in the case of the paella (which we dubbed “plov”, a Soviet Central Asian rice dish) and some of the tapas dishes – “memorable for poor imitation” of the Spanish originals. The one highlight of the evening was the red wine, Marques de Vitoria Tinto Crianza 2002 (2140 rubles), which was very delightful and balanced. The kind supposition would be that perhaps the owners decided budget cuts were in order after the crisis hit, so the authentic chef was cut out – the less kind that a Spanish chef was never intended. 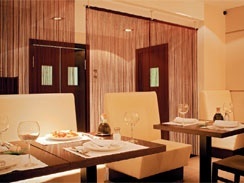 In the case of Alioli, it appears that the foreign chef never made it to Moscow and that the current staff has never been near real Spanish food. The elimination of the expensive foreign chef within a few months of opening has been a common occurrence at Moscow restaurants, once management believes that the newly trained domestic cooks will be adequate. At Japanese and sushi restaurants in Moscow, the belief that form means substance is driven to an extreme where Central Asian cooks and waitresses take the place of Japanese simply because they look Asian. It would be great to have a good Spanish/tapas restaurant in Moscow, and although the location and premises for Alioli are good, this isn’t it (yet). 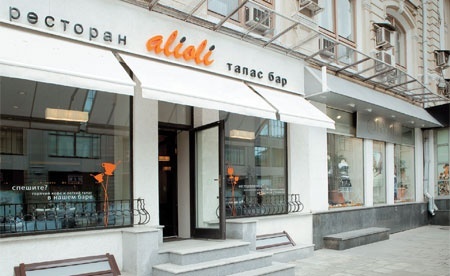 Instead, Alioli is a kind of poster child for some of the problems that Moscow restaurant culture exhibits where form is emphasized over substance and name over reality.